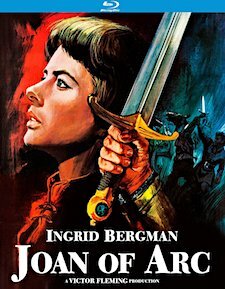 Based upon the 1946 Broadway play by Maxwell Anderson, director Victor Fleming’s Joan of Arc tells the story of the historical “Maid of Orléans,” from the point in her teenaged life where she’s compelled by visions to seek out the French Dauphin (José Ferrer, in his first film appearance) – in order that she might be allowed to rally his armies in resistance to English occupation in the Hundred Years’ War – until her death in 1431. The title character is played by no less than Ingrid Bergman, who was in her 30s at the time and yet gives a passionate performance that garnered her an Oscar nomination. In his final turn behind the camera, Fleming (best known for Gone with the Wind, The Wizard of Oz, and Dr. Jekyll and Mr. Hyde) mounts an impressively lavish production that includes an epic depiction of the siege of Orléans. But it’s this grand scale, combined with the film’s heavy, second-half focus on religious and political intrigue, that ultimately keeps Joan of Arc from greatness. Bergman’s performance is far from a weak link, but it eventually becomes so overshadowed by the mise-en-scène that the film’s climax is strangely lacking in energy and emotional impact. Still, the production design is genuinely splendid and Joseph Valentine’s expert cinematography captures it beautifully. Be sure to watch for Ward Bond (It’s a Wonderful Like, The Searchers) in a fine supporting role. In honor of the film’s 70th anniversary, Joan of Arc has been scanned in 2K and restored by the UCLA Film and Television Archive. It’s presented here in 1080p at the original 1.37:1 theatrical aspect ratio. The image is windowboxed (by design) to start. Once the titles finish, the frame opens onto a standard full frame presentation that uses the complete vertical image area, with black bars on either side. Joan was a Technicolor production, and that color has been exquisitely reproduced in HD. Aside from a little bit of instability and a bit of faint bleeding, the colors are luminous and richly nuanced. Contrast is excellent with deep blacks. Fine detail and texturing are good as well. Mild instances of dust, dirt, and scratches are occasionally visible, particularly during optical transitions, though there’s nothing egregious. This image exhibits lovely depth and is very pleasing. Sound is included in English 2.0 DTS-HD Master Audio only. The original audio was mono, so the 2.0 presentation simply spreads this a little more widely across the front soundstage. Clarity is generally very good and the track is clean, with no discernible hiss, defects, or distortion. There are no subtitles. In terms of bonus features, the Blu-ray Disc includes only trailers for other classic films available in the Studio Classics line (some in HD, some in SD), including Intermezzo, David & Bathsheba, Prince of Foxes, The Vikings, Taras Bulba, and Kings of the Sun. The packaging does at least offer reversible cover artwork featuring the film’s iconic (and certainly preferable) one-sheet image: a sword-wielding Joan in full armor. Joan of Arc is not a great film, but it is a good film, and it’s safe to say that it’s never looked better on any home video format than it does here on Blu-ray. If you’re a fan, Kino Lorber’s new Studio Classic release is welcome indeed and certainly recommended.